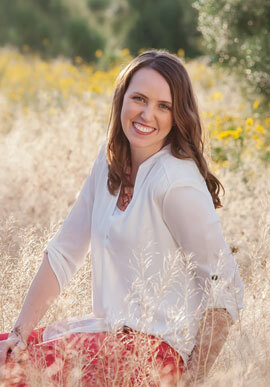 This is the beginning of my “Ask A Photographer” series! If you have a question about your camera, or how to take pictures of your kids, send it to me! I’ve got tons of experience helping moms just like you, and I want to help. I’ll email you back within a day with the answer, and some of the questions will appear on the blog too. Enjoy! I just purchased a Nikon D5300 with the kit lenses. My daughter has a violin concert coming up and I really want to take good pictures of it. It is a very large theater so we will be far away from her. The stage is brightly lit. Can you recommend a setting to use? Also, I’ve heard the 35mm f/1.8 lens will do better in low light. Should I use that lens for pictures in a large auditorium? Let’s cover your second question first: should you use a 35mm lens in a concert hall? The answer is probably not: you won’t want to use the 35 mm lens you mentioned in a concert hall. Yes, that lens will let in more light, but it will NOT zoom at all, so your pictures will depend on where you’re sitting and how faraway that is. If you had front row seats you might be able to get a good angle, but a versatile zoom will offer much more options. You will probably be frustrated with a fixed wide angle lens in a concert hall because you won’t be able to change seats and move to get closer, etc, and all your pictures will look the same. If you had bottomless pockets, you could a very expensive lens that would let in more light AND zoom, but that lens would cost more than the camera you just bought. So, just use the lens that came with your camera, and save the 35mm for indoor photography in your home, where you have an element of control. So, on to your actual question ,which is essentially: how do I get a good picture of my child on stage at a concert/play/musical? 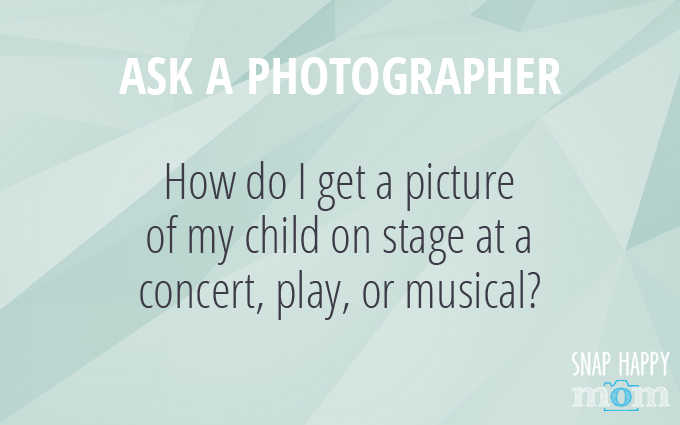 Concerts are hard because everyone want to enjoy the concert, but people also want to get pictures of their kids. You probably can’t get a decent picture from your seat, which means you’ll have to stand in the aisle or the side for a minute to take a picture… but be careful not to annoy the other parents. Don’t ruin anyone else’s experience just to capture your own child on stage. (I’m talking to you, iPad-user who thinks it’s ok to hold your your iPad over your head to get a photo. Don’t even think about getting a video). So, use the lens you have, and zoom in as far as you can. Even if the stage is bright when you’re standing on it, that light will probably not be strong enough to reach your camera. Absolutely do not use flash- it won’t reach your daughter anyway, and is a sure way to annoy people at the concert or even get kicked out. What you need is for your camera to maximize the effect of the light in the room. If you are reasonably comfortable with how to manipulate settings on your camera, I’d put it aperture priority mode (the A on Nikon, or Av mode on Canon) and dial your aperture all the way open (f/3.5 on the kit lens, but if you zoom in it will jump to f/5.6). You want the lowest number you can get, to make the opening for light as large as possible. Change your ISO to a very high number (1600 or 3200 probably). This will make your camera more sensitive to the light in the room. Then, the camera will figure out the shutter speed based on the light- it will just depend what the light looks like there. Hopefully it won’t be too slow (anything slower than about 1/125 will not freeze her motion). Remember to focus carefully on your child, because a big aperture means you have a shallower depth of field, and she might be slightly blurry if you focused generally on the stage instead of her. I will warn you… the chances of getting an amazing picture in a large theater are slim. You can absolutely get a picture with her in it, but make sure you go in with the right expectations. Your results will just depend on the light in that room. You can try the things I’ve mentioned (high ISO, wide aperture number, reasonably slow shutter speed) to let in more light, but sometimes that’s all you can do. Get a few pictures during the concert to look back on, but don’t expect them to look like a famous band concert. I do suggest you try to get a really good picture of you child with their instrument not on the stage. One option is to take a good one before the concert when she’s all dressed up and ready to go. Another would be to get one with the music teacher afterward, when the jitters are gone and she’s proud of her performance. Have a question? Ask me! I’ll get back to you within a day! Another tip – try to sit on the front row or at least as close as you can.